If you’re a Trim Healthy Mama, you know how challenging it can be to find food items that are on plan. It adds another layer of complexity to the grocery store experience when you’re first starting out. But don’t despair! I’ve assembled hundreds of THM friendly ingredients, treats, and products right here in my Amazon affiliate Trim Healthy Mama Store! Some of the items are there so that you can see the packaging…a huge help when looking for it locally in your own store. Other items are harder to find locally or are just really great deals, especially with the FREE Super Saver Shipping option! 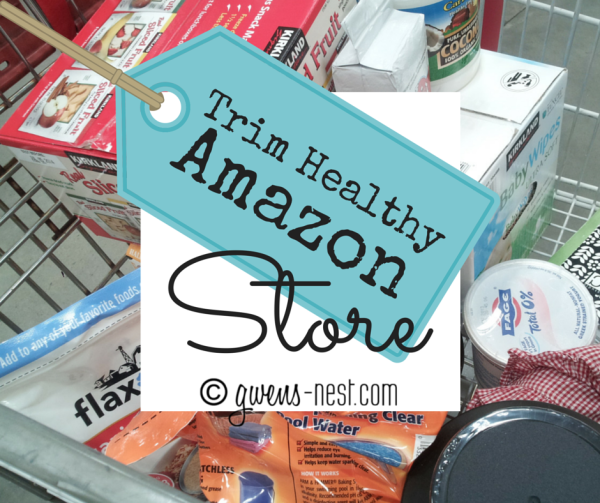 I’m a BIG fan of Amazon, and love to do my own shopping there for ingredients, supplements, and household items. In fact, that’s how my affiliate store got started…from my own personal wish list of products that I love to buy on Amazon. A local friend asked me to put together a list of items and the Trim Healthy Mama store was born. I do try to keep it updated regularly with new products. If you find something that you’d love to see in the store, please leave me a link or comment (with brand name), and I’ll add it for you. Hi Gwen ! Thanks for the shopping list. Why or how do you use the different brands (Great Lakes vs. custom collagen) of collagen in your THM? I understand the difference between gelatin and non gelatin. Do you just use them the same and like both brands? I’ve used Great Lakes (It’s what’s in my cabinet), but the price on the custom collagen is so tempting and it’s also great quality like Great Lakes. 🙂 It’s my next purchase! Gwen, you are an amazing woman!! Blessings to you. I enjoy your website, thank you for all that you put in to it to help so many of us out there in “cyber land”. Aw…shucks. ♥ 🙂 Thanks, Shannon! I do think that a lot of the allergen free ladies use gelatin as a thickener. It’s not something I’ve experimented with a lot, and it may take some tinkering to find the right ratio. I would be shocked if the info was not available on the Allergen Free THM group. 🙂 They’re incredible with substitutions. I use monk fruit extract, but I’m not sure what the “official” stance is on it. It’s non-glycemic, so I don’t have a problem with it.